About two months ago, I had to sit and take another work related training class. The instructor was utilizing a laptop with a USB wired mouse to move her PowerPoint demonstration through each slide. She forgot she was wired to the laptop and began to move away while she talked. Thankfully, another fellow sufferer sitting through this class saw what was happening and was able to grab the laptop before it fell to the floor. The old way of doing presentations by sitting near the laptop so you can scroll through the slides has long been overdue for a change. Yes, there have been wireless mice using a USB wireless dongle to do wireless presentations but they still used a USB port to do it. 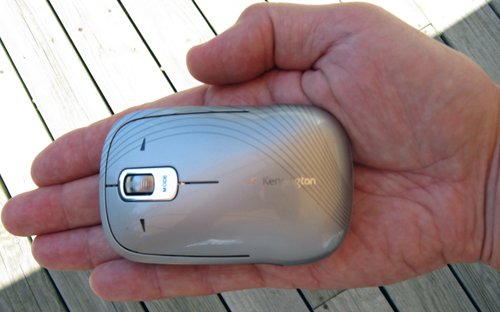 Kensington’s SlimBlade Bluetooth Presenter Mouse changes the old way of doing things. Open up the package, follow the simple instructions, sync your SlimBlade to your Mac or PC via Bluetooth and get to work. I had absolutely no problems in setting up the SlimBlade BT mouse for use with my MacBook. Press the power button that is hidden under the slidable trim and look for the green power indicator on the opposite side to glow solid green for three seconds, then depress the mode switch that is located at the scroll wheel for three seconds and you’re ready to go for regular use as a mouse. The SlimBlade is a full featured laser mouse that just performs two functions, both very well. If you want to use the SlimBlade™ Bluetooth® Presenter Mouse in presentation mode, you simply click on the mode switch twice and you will see ten flashes on the left and right buttons on the mouse and you are now ready to work with your presentation. Click the right button to move forward, click the left button to go back. Need to come out of presentation mode, just double click on the mode button and you’re back in normal mouse mode. I used the mouse performing “normal” mouse duties and used it in presentation mode. Switching between the two modes is simple and easy. 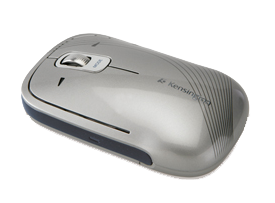 For someone who does Powerpoint or Keynote presentations, and who does not want to be chained to the laptop by a mouse cord or by utilizing one of a limited number of USB ports, the Kensington SlimBlade Bluetooth mouse offers the user the best approach to being mobile and to making use of what your laptop has to offer. What I considered to be its most useful aspect is its small size. I can hold the mouse in my hand and no one would really even notice that it’s even there. As you can see below, it readily fits in the palm of my hand and allows me to control a presentation through the magic of bluetooth. There is no additional transmitter plug-in that you have to carry around with you and possibly lose. Another nice point of this mouse is that when your laptop goes to sleep, so does the SlimBlade. I tested out the range of the mouse and it does have about a 30 foot range. Why anyone would need a Bluetooth mouse with a range greater than 30 feet is beyond me unless they’re working in a really large auditorium. Since it uses two AAA batteries with a useful life of well over three months, the SlimBlade seems to have all the bases covered. I’m using it straight out of the box, no software installation needed. Pro: Mac/PC compatible, easy to set up and use, Bluetooth frees up a USB port for other uses, no additional items need to be used for connectivity, small size. When your laptop goes to sleep, so does the mouse. SlimBlade has about a 30’ range. Bluetooth connectivity was easy, SlimBlade looks and feels good in use. Con: The instruction sheet that came with the mouse is the most limited instruction sheet I’ve encountered, unless the detailed instructions are printed in one of the other languages on the sheet rather than in English. Warranty: Kensington limited 5-Year Warranty and free technical support. My Mac rating: 4.5 out of 5.